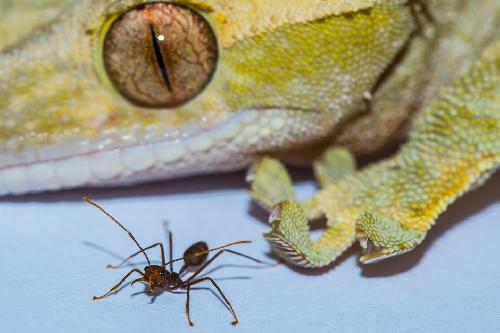 Latest research reveals why geckos are the largest animals able to scale smooth vertical walls - even larger climbers would require unmanageably large sticky footpads. Scientists estimate that a human would need adhesive pads covering 40% of their body surface in order to walk up a wall like Spider-man, and believe their insights have implications for the feasibility of large-scale, gecko-like adhesives. A new study in PNAS shows that in climbing animals from mites and spiders up to tree frogs and geckos, the percentage of body surface covered by adhesive footpads increases as body size increases, setting a limit to the size of animal that can use this strategy because larger animals would require impossibly big feet. Dr. David Labonte and his colleagues in the University of Cambridge's Department of Zoology found that tiny mites use approximately 200 times less of their total body area for adhesive pads than geckos, nature's largest adhesion-based climbers. And humans? We'd need about 40% of our total body surface, or roughly 80% of our front, to be covered in sticky footpads if we wanted to do a convincing Spider-man impression. Once an animal is big enough to need a substantial fraction of its body surface to be covered in sticky footpads, the necessary morphological changes would make the evolution of this trait impractical, suggests Labonte. "If a human, for example, wanted to walk up a wall the way a gecko does, we'd need impractically large sticky feet - our shoes would need to be a European size 145 or a US size 114," says Walter Federle, senior author also from Cambridge's Department of Zoology. "As animals increase in size, the amount of body surface area per volume decreases - an ant has a lot of surface area and very little volume, and a blue whale is mostly volume with not much surface area" explains Labonte. "This poses a problem for larger climbing species because, when they are bigger and heavier, they need more sticking power to be able to adhere to vertical or inverted surfaces, but they have comparatively less body surface available to cover with sticky footpads. This implies that there is a size limit to sticky footpads as an evolutionary solution to climbing - and that turns out to be about the size of a gecko." Larger animals have evolved alternative strategies to help them climb, such as claws and toes to grip with. "We compared animals covering more than seven orders of magnitude in weight, which is roughly the same as comparing a cockroach to the weight of Big Ben, for example," says Labonte. These investigations also gave the researchers greater insights into how the size of adhesive footpads is influenced and constrained by the animals' evolutionary history. "We were looking at vastly different animals - a spider and a gecko are about as different as a human is to an ant- but if you look at their feet, they have remarkably similar footpads," says Labonte. "Adhesive pads of climbing animals are a prime example of convergent evolution - where multiple species have independently, through very different evolutionary histories, arrived at the same solution to a problem. When this happens, it's a clear sign that it must be a very good solution." The researchers believe we can learn from these evolutionary solutions in the development of large-scale man-made adhesives. "Our study emphasizes the importance of scaling for animal adhesion, and scaling is also essential for improving the performance of adhesives over much larger areas. There is a lot of interesting work still to do looking into the strategies that animals have developed in order to maintain the ability to scale smooth walls, which would likely also have very useful applications in the development of large-scale, powerful yet controllable adhesives," says Labonte. There is one other possible solution to the problem of how to stick when you're a large animal, and that's to make your sticky footpads even stickier. "We noticed that within closely related species pad size was not increasing fast enough to match body size, probably a result of evolutionary constraints. Yet these animals can still stick to walls," says Christofer Clemente, a co-author from the University of the Sunshine Coast. "Within frogs, we found that they have switched to this second option of making pads stickier rather than bigger. It's remarkable that we see two different evolutionary solutions to the problem of getting big and sticking to walls," says Clemente. "Across all species the problem is solved by evolving relatively bigger pads, but this does not seem possible within closely related species, probably since there is not enough morphological diversity to allow it. Instead, within these closely related groups, pads get stickier. This is a great example of evolutionary constraint and innovation."